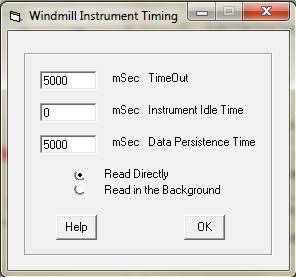 Windmill software lets you continually log data from Sartorius balances, and other instruments with RS232, RS485 or TCP/IP serial ports, on a PC running Windows. All data is time-stamped and can be imported into Excel either during or after data collection. Our Windmill with the COMIML software is currently reduced from £145 to £50 when you buy from our on-line catalogue. Details on entering the Sartorius configuration settings into ComDebug are below. "Thanks! It worked really well...very happy with the program." Note: Sartorius's RS-232 cable has a unique pin out - it is not a standard cable. You need to either purchase the correct cable from Sartorius, or re-wire the connections. Read this in conjunction with the step-by-step instructions on our Getting Started page. 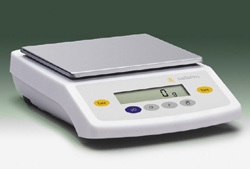 Here we give the specific settings needs for Sartorius balances and scales connected via RS-232. These must be the same as your balance uses. These are the default factory settings for Sartorius Talent, Gem and Gold balances. Your settings here depend upon how you have configured your balance. In ComDebug's Message Screen, enter a command or prompt string to send to the balance to ask for data. Click the Send button, and the instrument should send a reply (see Trouble-Shooting below if not). Now click the Parse button and enter instructions to extract the data from the balance's reply. These settings work for CP balances. Use the non-print menu to enter the Escape character (027), carriage return (013) and linefeed (010). Choose read directly unless your balance has automatic data output enabled, in which case choose Read in the Background. Make sure that the balance is set to ASCII rather than printer mode. Check for a cabling problem. Sartorius's RS-232 cable has a unique pin out: it is not a standard cable. You need to either purchase the correct cable from Sartorius, or re-wire the connections. These two tables show the connections for 9-pin and 25-pin cables. For more on pin connections and RS232 see our Serial Port and RS232 Communication page. If you see data but it doesn't make sense, check that your balance's operating mode is ASCII and not Universal Printer. Use the balance's Operating Menu - Data Interface - Communications mode. If you have "unstable" conditions and get correct readings when collecting data slowly, but miss readings at higher speeds, you may need to change settings at the balance. For example, when dripping liquid onto the balance it takes a while for the reading to stabilise. In this case try altering the resolution required for the balance to think the reading is stable (on the balance itself, not in Windmill). Otherwise the next drop may arrive before the balance considers itself stable enough to report its reading.